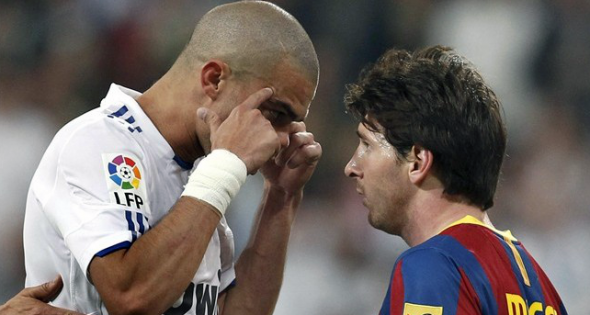 Home » casillas , crazy hair , Defender , messi , Pepe , Portugal , Real Madrid » Has Pepe Lost His Marbles? Pepe has always been a strange character, on and off the field but lately I have started to wonder if what has happened to him has a medical explanation. He has done some incredible stupid things during his professional career like stomping on Messi’s hand during a game between Real Madrid and Barcelona. The latest was the head butting of Muller at the World Cup which got the Brazilian born Portuguese defender a red card and one game suspension. After so many incidents involving Pepe you start to wonder if he has lost his marbles, and you try to find excuses for him or reasons that would take a regular person to do some of the things he has done. You search and search and almost come out empty handed, there are no logic explanations for the things he does, but then you look at the stress of playing at the highest level, and for a club of the magnitude of Real Madrid and you think that perhaps sometimes the pressure is too much and he loses his mind for a split second. It happens to the best of us, we have all lost our mind just to look back at it and wonder what the hell we were thinking. This was my thought process when analyzing Pepe that was until I came across on twitter with the photo below. He has clearly lost not only his marbles but also the plot. Who does he think he is? He his inner channeling the spirit of ODB or is he trying to go for the Coolio look? Either way he is completely insane and while he thinks Casillas is posting in the picture laughing with him, he is most definitely laughing at him. 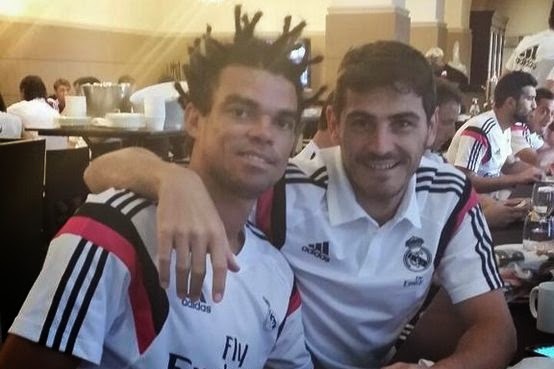 The joke is on you Pepe, you look like a homeless guy wearing a Real Madrid jersey, I have personally never seen a homeless guy in a Real Madrid jersey but I am sure if I gave one to the guy outside Starbucks near my work place he would look like his twin brother, twice removed. Somebody please hug him, he looks like he needs some hugs and love. He must be hurting inside if he has this desperate need of seeking attention. He could be an incredible defender and yet he rather act like a bully who now also wants to take his chances at gangsta rap in a Coolio kind of way. Either way the man is not well, and with Suarez coming into the league I expect these two to go all out at each other in what will most likely go down in history as the craziest clash ever. It will be a matter of time before they have to play against one another and sparks will fly. Until then can someone find his marbles and give them back to him? He desperately needs them, like a baby needs milk.